Energetic properties of foods are an individual matter and depend on food quality, preparation method, digestive capacity and cellular function. In order to convert food into energy, various nutrients are required, and in order to extract and utilise these nutrients, food has to be digested well. These nutrients include B vitamins, magnesium ,manganese, l-carnitine and amino acids from protein breakdown. Interestingly, digestive issues are common in chronically fatigued people who always express symptoms of various deficiencies. The more digestive work a food requires, the less energy remains for other functions. Moreover, processed foods are devoid of nutrients which they still require to be metabolised so they are being ‘robbed’, leaving a person depleted and wrecked. Stimulants and processed carbohydrates cause a blood sugar roller coaster which is a stressor that stimulates the release the stress hormone cortisol each time blood glucose drops. For example, a breakfast consisting of a bun and coffee or cereal with milk will give an instant energy boost followed by a rapid drop, and this is when cortisol is secreted to raise blood glucose so that energy is maintained. When nutrient-poor dietary choices or skipped meals become a habit, the adrenals may not secrete enough cortisol any longer, and the person can hit the wall. Therefore, relying on caffeine and processed cabrs to keep going is like whipping a dead horse. Moreover, chronic emotional stress, infections (e.g. 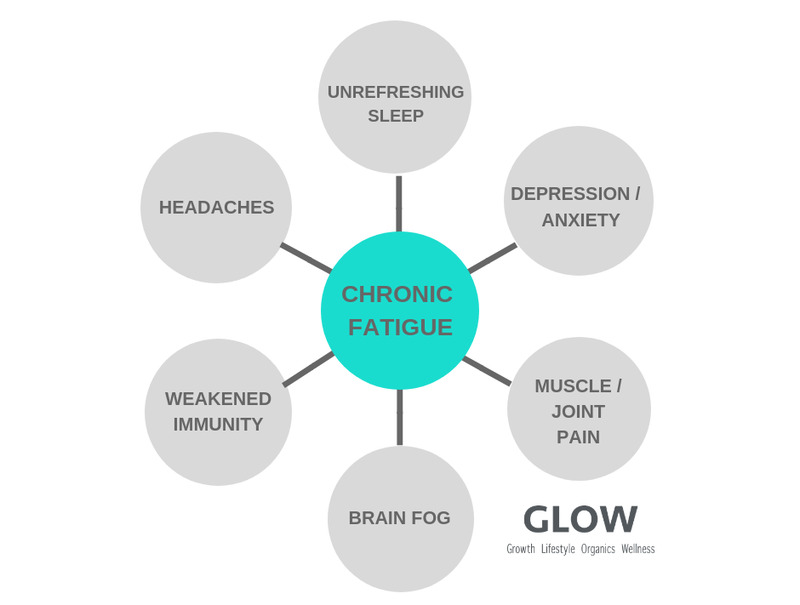 lyme, parasites, candida, EBV), pain and even food intolerances are all stressors which over-engage the adrenals in the same way, leading to fatigue. As a result of poor digestion and absorption or a nutrient-poor diet, the brain is missing sustainable fuel to deal with everyday tasks, not to mention stress, emotions and lack of alignment with oneself (i.e. doing anything that’s mentally draining), which can deprive the entire body of energy. The brain doesn't like blood sugar roller-coaster, and thrives on fat. But again, in order to extract the essential fatty acids and fat soluble vitamins from the ingested fat, digestion has to be optimal. The main organs responsible for proper fat breakdown are the liver, gallbladder and pancreas. The thyroid controls the speed and intensity of all bodily processes. Depending on the signals coming from the external and internal environment, the brain and adrenals signal the thyroid if it should speed things up or slow them down. Although full thyroid assessment is key when establishing the cause of fatigue, it’s usually not just the thyroid that requires support but body’s whole biochemistry, ecosystem and lifestyle influences that affected the thyroid in the first place. Compromised digestion, processed foods, drugs, environmental toxins, toxins released by pathogens (e.g. gut bacteria) and chronic stress contribute to an increased intestinal permeability commonly called ‘the leaky gut’. This allows for undigested proteins and these toxins to enter the blood stream, which signals the immune system to attack. The toxin together with an antibody create ‘immune complexes’ which can attach to various places in the body, one of them being mitochondria, power stations of cells. Therefore, gut toxicity can directly affect cellular energy production. Iron, vit B12 and folate are responsible for red blood cell oxygenation and maturation. Although deficiency can result in fatigue, people often don’t realise that they are deficient because serum levels of B12 and folate are not reflective of their cellular level, for which different tests are required. Anaemia is never the root cause. It is a symptom related to absorption issues resulting from impaired digestion, diet, gut dysbiosis, or poor methylation. The priority is identifying the individual cause of fatigue, addressing digestion and gut ecology. In each case however, it’s as a sign to listen to your body as it’s trying to tell you that it needs to be looked after. 1. Chronically fatigued people should focus on warm whole foods that are easy to digest: soups, stews, curries and stir fries. Cultured dairy, fermented vegetables and sourdough bread will also be easier to digest than their unfermented counterparts. Salads and smoothies should be introduced when energy improves. 2. Vegetable juice doesn’t require much digestion and provides easily absorbable nutrients, which makes it an energising food-based supplement. 3. Hot water with fresh ginger, stock, broth, miso soup and digestive enzymes taken prior to meals can help to extract more energy from food. 4. Targetted probiotic therapy will help to rebalance the gut but it's counterproductive without dietary adjustments that suit a particular individual. 5. Best to start the day with a protein and fat based breakfast like eggs and quality bacon, which will prevent from blood sugar roller coaster. 6. Sipping on mineral water with a pinch of sea or rock salt and a sqeeze of lemon juice is a fabuous drink that supports the adrenals. 7. Last but not least is lifestyle: sleep, relationships, work, contact with nature and movement. Sleep is especially important as it helps to lower inflammation and improve stress response. However, it's not just the length of sleep but also the hours of going to bed and getting up that really matter. The later one goes to bed and gets up, the bigger the chances of lower blood pressure and poor energy throughout the day. Starting with small steps of lifestyle changes should certainly be the first call of action before looking deeper for physiological causes.